your own label/brand from inception to finished product. We can also package our rice in your established label/brand to order. 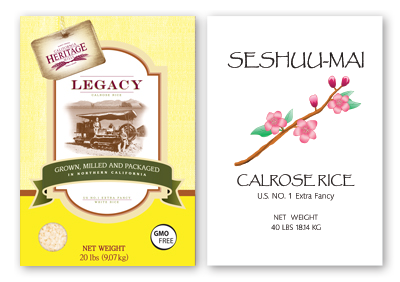 We have developed two in-house brand/labels that can be offered to our preferred customers in select target markets: Legacy and Seshuu-Mai. Custom sizes from 1lb. bags to 1 Metric ton super sacks. Virtually any size bag can be accommodated. We are able to package and seal any type of packing material from cotton, poly, paper, BOPP and laminates.